Within a few months of being on my own, the dreams started. I won’t say nightmares, because nightmares have a distinct sense of terror and harm; my dreams weren’t always like that. I was working as a nurse on an medical-surgical floor for oncology patients in a major urban hospital. Just out of school, I managed to fall into one of the most hostile units in one of the worst hospitals in Miami. My manager crawled her way up from more than a decade as a floor nurse, and with little education or qualifications, guarded her job like a prison guard, rifle in arm, from a watchtower. She would scream at nurses at the desk and make grown women cry. Write-ups blasted like machine gun fire, and people were canned for no reason at all. My first run-in with her was during training, where she screamed at me in front of a patient because of a misapplied label and nearly had me fired. Eventually she too would be fired, but it took 10 years too long. 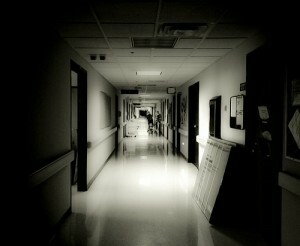 It’s not simply management that terrorizes you in the hospital; it’s the sense of total impotence. You don’t control the flow of work, and you can’t control how things occur. Capitalism likes predictability and regularity, but bodies resist this. It’s one reason they haven’t been able to fully mechanize hospital labor away, bodies change and people for the time being make better assessments. The problem is that the flood of patients keeps rolling, coming and going despite dangers, emergencies, or your soul all day, 13 hours. You can’t stop it because managers run the place, and because you are chained to the bed, legally bound to remain with your patients until someone takes your place. Nurses can be charged with abandoning patients by law, and they act under a license provided by the state. Whatever happens, management doesn’t even need threats because the state essentially gives the green light for them to abuse you. If you end up doing something wrong because you worked decades of 13-hour days without breaks, meals, and without pause, it isn’t the hospital that engineered a systemically dangerous environment for patients that is held liable, it’s you. You can lose your license, be fined, and spit out by a system that is built to grind labor out of you, risking patient’s lives at every step. This is where the dreams come from. Sometimes I would dream that I’m in prison, locked up for missing something crucial or giving the wrong medication and did a patient harm unintentionally. At other times my dream is reliving the suffering of other nurses, with me in their place being humiliated in front of everyone else, screamed at, and treated like a beast. I dream of angry patients, the sexual harassment from drug addled patients, crazed jealous families, violent psychotic patients, and scheming nurses. The worst part of the job is when it is so bad, when you work 14 hours in one day, and you come home so full of adrenalin that you can barely sleep. In the shower I hear IV pumps beeping still, and my ears pick up a dull buzzing for hours after I’m off work. You toss and turn, chewing on all the things you could have missed in the day, and fearing all the harm that could happen because they make this game so that every day you work, you risk people’s health. When you fall asleep, the days can haunt you. I’ve had weeks where every dream was about work. That is the problem with capitalism, not just the harm it does to workers and patients, but that it’s hell lingers and penetrates our dreams, degrading them. This post is part of a series on work, sleep, and dreams. Scott is a member of the editorial group here at Recomposition, a member of Miami Autonomy and Solidarity, and he writes a blog of his own. The worst part of the job is when it is so bad, when you work 14 hours in one day, and you come home so full of adrenalin that you can barely sleep. In the shower I hear IV pumps beeping still, and my ears pick up a dull buzzing for hours after I’m off work. I have really enjoyed the direct accounts of people's work experience coming out of recomposition lately, such good stuff. I currently do care-work and have had what seems to be a similar experience at past jobs, most notably in a group home. I've never had a job get me so wound up at the end of the day. I'd get off at 11 at night every week-night and would have trouble falling asleep as my entire 8 hour shift replays itself in a private "for me only" show inside my brain. During these shift replays, all the worries about what you may of forgotten persistently haunt you, and steal your peace. How can a person recharge the vital labor power? Prior to that I worked as a production worker in a factory off and on for years Though it had a major list of drawbacks I won't get into, at least most of my time outside of work wasn't consumed with the events of the most recent shift. Rather, because the work failed to engage the mind, my shifts were spent using my imagination. Any unfortunate case of the "shift replays" following an 8 hour session at the plant was just a journey back into all the cool pipe-dreams I had, and not much else. Thanks Bozeman. If you're ever interested in submitting something about your work experience, contact me or Juan privately please. This all sounds very familiar to me... Sometimes I wake in the night to realise I've been dreaming about all the prep work I need to get done when I go into the kitchen in the morning. Its not just the long hours, its the fact that most of the time is spent working extremely hard under immense pressure. Its infuriating when I find myself spending my precious free time thinking about work. This is why so many chefs (and apparently nurses) are into drugs. I try to stick to yoga but its not always easy. That reminds me of a job I had as a welder-fabricator doing twelve hour shifts every day. It was mostly bench-work using Tig welding and extremely boring so I got through the day smoking hash! We had ten welders there and they were all into it. At the end of the day we were as high as kites, some of us never even knew what day it was, but that's what we did just to get by. It also helped to alleviate arc-flash if you got it.